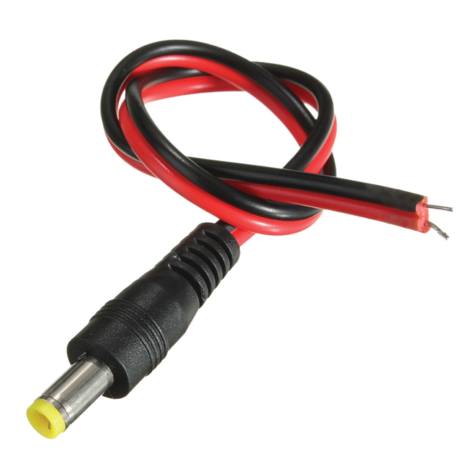 Reverse 2.1 mm DC Power Pigtails Plug Lead Cord wire. Material: PVC with pure copper connector and stripped and tinned ends. DC Plug Size: 5.5 x 2.1 x 12 mm (5 mm (outside dimension) x 2.1 mm (inside dimension)). Length of cable: 220 mm..
Colour Coded power connecter Red (+) for Positive and Black (-) for Negative to simplify installations. Application: Used to connect to camera power so you do not have to cut plug which in most cases will void warranty. Suitable For: led driver, strip connector, CCTV camera. “EiRA TEK” - derived from two words “EiRA”, a welsh word meaning snow/cool and “TEK”, an abbreviation used for technology. The company's flagship brand “EiRA” was established in the year 2015. Headquartered at New Delhi, we are pioneers in high quality IT peripherals, CCTV/Surveillance products, Lifestyle products and Smart Home Automation products. Under the guidance of our insightful, perceptive, talented and farsighted leader, Mr. Vishal Jindal, we aspire to become one of the leading brands and trendsetters in the industry. We have about 18 years of experience in the business (Previously as SVB International). Currently with 3 branches in India- Delhi, Uttar Pradesh, and West Bengal, we are covering most of the Northern and Eastern regions of the country throughout own offices and a vast network of dealers and distributors in these regions. EiRA focuses on staying ‘A Step Ahead’ in the market. Equipped with the latest technology and an Attitude of Perfection, we work on a model to make EiRA a globally respectable name. We aim to enrich one’s daily life by offering effective and reliable means of technology at an affordable price. We aspire to lead the market by setting trends and benchmarks in product, process and service for all. We believe in giving our customers state of the art cutting edge technology products. We have a spearheaded feedback system to keep in touch with our customers and their needs. We believe in good business competitiveness and therefore we go the extra mile for our customers.